Marinating pork shoulder with Smoked Garlic Seasoning and Sriracha chili sauce, and mixing the pineapple with vinegar for a sweet-sour effect will make the food sing. 1) In a small bowl, combine the salt and the smoked garlic seasoning. Set the pork fat side down on work surface. Using a boning knife, cut between the natural separations in the meat in about 4 places. Sprinkle the smokey garlic seasoning mixture all over the pork, then rub all over with the Sriracha. Roll up the roast and tie it at 1" intervals with kitchen twine; let marinate at room temperature for 2 hours. 2) Preheat the oven to 325 F. In a roasting pan, toss the pineapple with the brown sugar and vinegar. 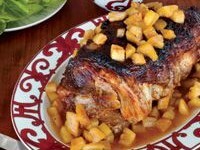 Spread the pineapple in the pan and set the pork roast on top, fat side up. Roast for 4 hours, basting every 30 minutes, until an instant-read thermometer inserted in the thickest part of the meat registers 165F. Transfer to a carving board to rest for 20 minutes. 3) Set the roasting pan with the pineapple over high heat and boil the pan juices until slightly thickened, 2 minutes. Remove the strings from the pork, carve into 1/2" thick slices and arrange on a platter. Add carving juices to the pan and season with salt. 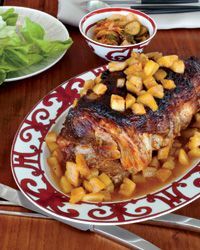 Serve the pork with the pineapple and pan juices.